Explore the oldest underground in the world. 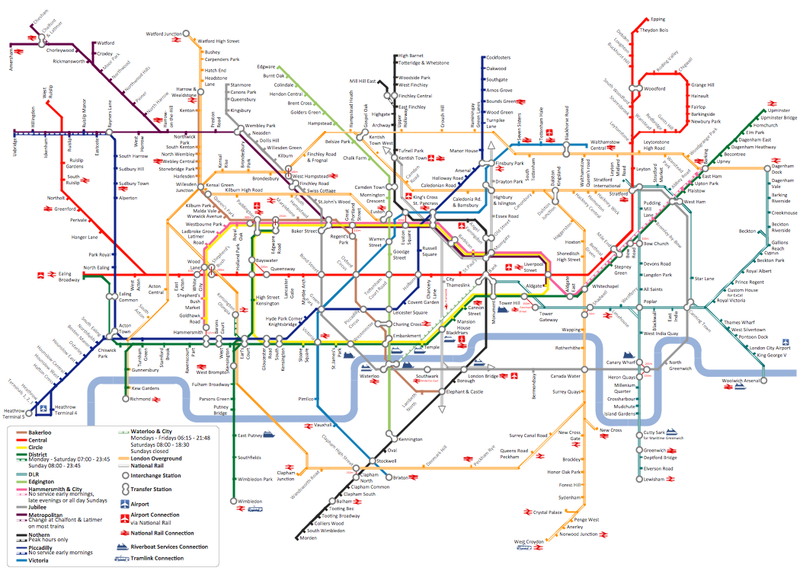 Opened in 1863, the London Tube today opens a new station inside ConceptDraw. This map was created in ConceptDraw DIAGRAM using the Transport Map library from the Metro Map solution. An experienced user spent almost 6 hours creating such complex chart. All source documents are vector graphic documents. They are available for reviewing, modifying or converting to a variety of formats (PDF file, Power point Presentation, image or MS Visio) from the Template Gallery of ConceptDraw DIAGRAM for all users who have installed Metro Map solutions. ConceptDraw collection of vector elements for infographics design. Subway infographic design elements for ConceptDraw DIAGRAM v12 (mac and pc). A list of parameters on which networks differ is very long. A large network with a range up to 50 kilometers is called metropolitan area network (MAN), and this type of network can include several local area networks. Metropolitan networks in their turn connect into global area networks. Here you will see a Metropolitan Area Network (MAN). This is an extensive network which occupies a large territory including a few buildings or even the whole city. The space of the MAN is bigger than LAN, but lower than WAN. MAN comprise a lot of communication equipment and delivers the Internet connection to the LANs in the city area. Computer and Networks solution for ConceptDraw DIAGRAM v12 provides a set of libraries with ready-to-use vector objects to design various kinds of computer networks. Tool to draw Metro Map styled inforgraphics. Moscow Metro sample. ConceptDraw Note Exchange Solution permits users to develop and organize notes and tasks in ConceptDraw MINDMAP v10 Your work can be accessed later, just with one click, regardless of preferred platform.